Who ever said that young Americans have a problem with learning foreign languages? It certainly isn’t the case with our latest interviewee. We have been in touch with Shannon Kennedy for some time now. ». Shannon is a saxophonist from California who shares her passion for languages, cultures, music & food via her blog, Eurolinguiste. Following our meeting, we decided to share her written interview which she herself completed in two languages – English and French. Assimil: When and how did your interest in languages begin? Shannon Kennedy : It wasn’t really until I was preparing for university that my interest in language developed. As a musicology major, one of the skills strongly suggested in the application, was that of possessing fluent reading ability in Spanish, French, German, and Italian. Latin if we were truly ambitious. I’m not sure what triggered it, but I jumped at the opportunity to learn Italian and German. I had taken language classes before – an Arabic class at our local university when I was about fourteen to have a secret language with my friend at school – but it didn’t really stick. For some reason, something changed this second time around. As school began and I gained access to the university library, I found myself drawn to the foreign language section more and more. I signed up for the maximum number of language classes allowed per student, and I checked out books regularly, staying in the library to read books on translation when I had maxed out my limit at home. When I finished school, my fascination with languages and my love of the learning process stayed with me. I began studying Croatian, and then, Mandarin. It’s something I really enjoy doing. I cannot imagine my life without language learning. How many languages can you speak today? Music is usually considered as a the only true universal language. Do you agree with this? How would you compare the two in your experience? That’s a really good question. Music is certainly one language that can be shared regardless of however else one might communicate. One of the amazing things about music is that no matter where one is from, no matter the language they speak, musicians can come together and perform together, often seamlessly. We had an experience like that recently at the World Youth Jazz Festival in Malaysia. We flew out to perform with a group of local musicians and it was an amazing experience getting to rehearse and perform a concert with musicians that we had not met before the day of the show! Apart from that, it’s easy to see how the two might be thought of as similar. Both require a lot of hard work and dedication to learn. Both require regular (read daily) practice to maintain. We arrive at plateaus in each and need to learn to push through them. In both we experience periods of frustration, joy, breakthroughs, regression, accomplishment, and growth. We can be entirely immersed in both. We can share incredible experiences with others through both. We can share our stories through both. I’ve often heard that musicians make better language learners. I’m not sure if that’s true, but if it is, it makes me appreciate having both in my life all the more. What kind of resources do you use to learn languages? I am an advocate of using a variety of diverse resources to fully develop all aspects of one’s language skills. In my experience these are listening, speaking, reading, and writing. Although different learners may have different goals for the languages they are learning, mine are to learn the languages I speak as completely as possible. I know that I will never speak as well as a native speaker in a language that is not my own, but that doesn’t stop me from wanting to get as close as possible (and yes, I know I still have a ways to go, but I am loving the journey that I am on). I actually just updated the resource page on my blog, Eurolinguiste.com. You can better idea of some of the resources I use there. Can you tell us what you believe to be the main benefits of being multilingual ? (do not hesitate to be specific and to tell about your own experience). One of the greatest benefits, in my personal opinion, of being multilingual is that I have had the opportunity to meet a ton of incredible people that I would not have met if I did not 1) have an interest in language; or 2) speak their language. I feel as though it has made me a better person. I’m more aware of things beyond my own culture and language and it’s very rewarding. There is also a truly wonderful community of language learners out there and I have been absolutely honored to have had the opportunity to get to know many of them. It’s rewarding to know so many like-minded people. Tell us about your blog, Eurolinguiste. I started my blog, Eurolinguiste, to share my personal experience learning languages. I shared my language learning process, what worked for me, what didn’t, and where I went to use the languages that I’m learning. It has since evolved into something I couldn’t have expected, but I’m glad for the change. It’s amazing to have the opportunity to talk about something that I truly love and get to connect with people who love the same things I do. In addition to languages, I also post cultural facts about the regions I am studying, recipes, and travel advice. What is your favorite book about language and/or linguistics? I read a rather interesting book on the history of the French language a while back. It’s called “The Story of French” by Jean-Benoit Nadeau and Julie Barlow. In the book, the authors write about their travels around the world and their research not only on the history of the French language in France, but throughout the French diaspora. It’s fascinating to read about all of the variations and how certain words entered the French language. I also love “Multilingualism” by John R. Edwards. When you visited Assimil’s office, you told me you interviewed French chanteuse Camille. Tell us more about this. While I was studying for my Master’s degree, I wrote a paper on the use of language and voice in pop music in France. I was very interested in how the English language has affected the French music industry (more and more artists are starting to record in English to try and break into markets outside of French-speaking countries). Camille has recorded in French, English and she even has songs with lyrics that shift from one language to the other. She is also very innovative in her use of the body and voice as instruments. I was very interested in finding out why she chose to write music in both French and English. She told me, “I do not express myself equally well in French and English. I express myself differently.” I found this very enlightening. You often hear the argument that our personalities change depending on the language that we speak (we, as in those who are multilingual). Languages are built around culture, and culture around language, so it would make sense that we express ourselves, our thoughts, and our feelings differently depending on the language we are speaking. It forces us to use different words. Anyone with any experience in translation will be able to relate. It’s often impossible to translate word for word, and so we instead aim to translate the meaning. But if we use a very particular word that just doesn’t exist in another language, the meaning will only be close, not exact. So it’s true, we have no choice but to express ourselves differently in each language we speak. Knowing this, I can see how artists would find interest in composing lyrics in different languages. The subtleties of language allow them to say things differently. 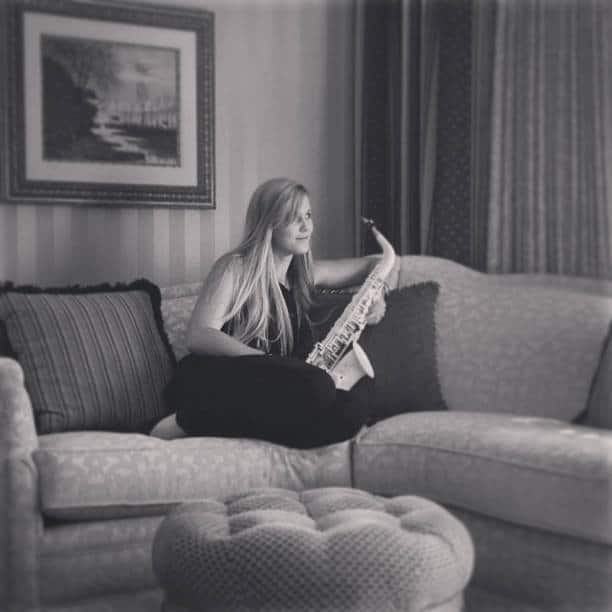 I primarily saxophone, flute, and keyboards but I also play clarinet, oboe, acoustic guitar, a variety of woodwind instruments from around the world such as Native American flute and duduk, and I also sing. I’ve played other instruments on and off throughout my career, but recently I’ve been trying to narrow my focus. Who’s your favorite contemporary saxophonist? I can’t pick just one. I really like Candy Dulfer, David Sanborn, Maceo Parker, Kenny Garrett, Joshua Redman, Michael Brecker, and Gerald Albright, just to name a few. What are the next languages on your schedule to learn? Next I’d really like to learn Japanese and Russian. I’ve played around with learning Breton, but I’m not sure if it’s one I’ll seriously pursue. My goal is to speak eight languages fluently.